Our Handmade Collection are Crafted in England by The Empty Box Company | Foster-Stephens inc. The Empty Box Company was founded in 1988 by James Teague and Giselle Hulme, to revive the old fashioned Edwardian Hat Box and Dress Box. James and Giselle had found an old Christie’s Hat Box in a Tailors shop in Norwich that was closing down. The lady had told them how much her customers were interested in that type of box and how she could have sold many if she had them. That began a journey of discovering how to make Hat Boxes in different sizes and designs, covered in beautiful British interior design papers, trimmed with lace, with a matching ribbon attached. 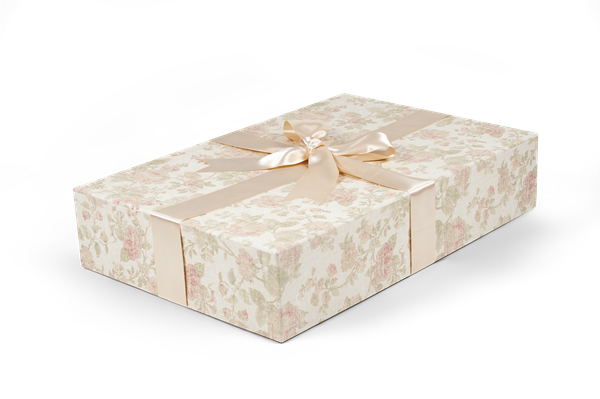 With further advice from The Victoria and Albert Museum, the first Empty Box Company Wedding Dress Box was made, complete with tissue paper and packing details with the addition of advice on storing a dress. Today they have 2 workshops; one in Surrey and one in Devon, where all the boxes are handmade. They strive to make a product that will not only last, but that is useful and yet beautiful, of the highest quality, handmade in England, supporting British manufacturing, and that does not leave a carbon footprint. Their production and sourcing supplies, is environmentally friendly wherever possible. Over the past 27 years, The Empty Box Company has made 3/4 million boxes to store the special keepsake items in people’s lives. These keepsakes tell a family story to the next generation. Their boxes have protected from flood and fire damage, and also store a Royal Wedding Dress. The Empty Box Company has made boxes for film and TV series including Downton Abbey, Mr Selfridge, Eastenders, Emmerdale, and theatre such as The Welsh National Opera. Here in the States they have been on the sets of Parks and Recreation, the Astronaut Wives Club and Gotham. Their uniqueness and beauty make them a popular asset for props departments. James and Giselle have thought it particularly special to be included in the Edwardian series of Downton Abbey and Mr Selfridge; achieving their goal to revive beautiful Edwardian Boxes! Foster-Stephens' thought this beautiful, decorative product by The Empty Box would be a beautiful addition to our many product lines of preservation materials.